One-hundred years in the making, Will Barnet at 100 – the artist’s first New York museum retrospective – exhibited at the National Academy Museum, September 16 through December 31, 2011. Will Barnet has worked in virtually every main museum in the United States, and his figurative and abstract paintings and prints continue to advance the fine arts. During a career that has spanned over 80 years, Barnet has been a printer for major artists, including Louise Bourgeois, a teacher of Eva Hesse, James Rosenquist, and Tom Wesselmann. Barnet celebrated his 100th birthday on May 25, 2011. Will Barnet at 100 consisted of 43 paintings and prints that range in date from 1935 – five years after he moved from Beverly, MA to New York City at age 19 – through 2008. The loan exhibition, which included works from numerous public and private collections, was organized by Bruce Weber, Senior Curator, Nineteenth and Early Twentieth Century Art, National Academy Museum, and was accompanied by an illustrated catalogue. Barnet was born in Beverly, MA in 1911. He moved to New York in 1931 and embarked on an 80-year career as an artist, printmaker, and instructor. Barnet taught at the Art Students League (1941-1979) and Cooper Union (1945-1967) in New York and at the Pennsylvania Academy of the Fine Arts (1967-1992) in addition to shorter term appointments. The works in the exhibition trace Barnet’s explorations of figuration and abstraction, including WPA-tinted realism, Hard-Edged abstraction, and Indian Space painting, with its fields of color and imagery inspired by indigenous art of North and South America. An impassioned student of the visual arts of many cultures, Barnet’s investigations have been informed by old and modern masters, Byzantine art, Hopi bowls, geometric patterns found in ancient Peruvian textiles, and American folk art. 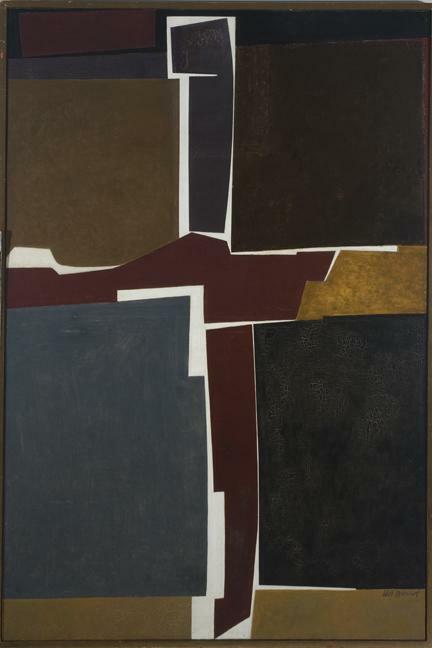 The arc of Barnet’s work runs from realism in the 1930s, when he worked primarily as a graphic artist and printer, to increasingly abstract work in the 1940s, full abstraction in the 1950s and early 1960s, and a figurative style in the 1960s through 2003, when he returned to abstraction. Highlights of the exhibition include Idle Hands, from 1935, in which a deflated man is seated, his elbows resting on his knees and arms crossed as his torso slumps forward. 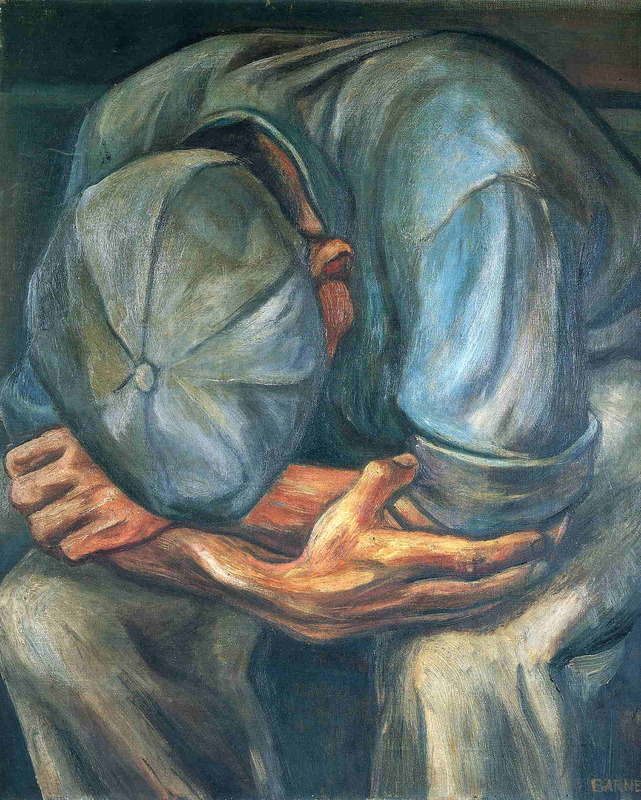 With a cap covering his downcast face, the figure illuminates the Depression-era plight of millions of people unable to find work. By 1946, when Barnet completed Soft Boiled Eggs, he had entered the realm of Modernism. 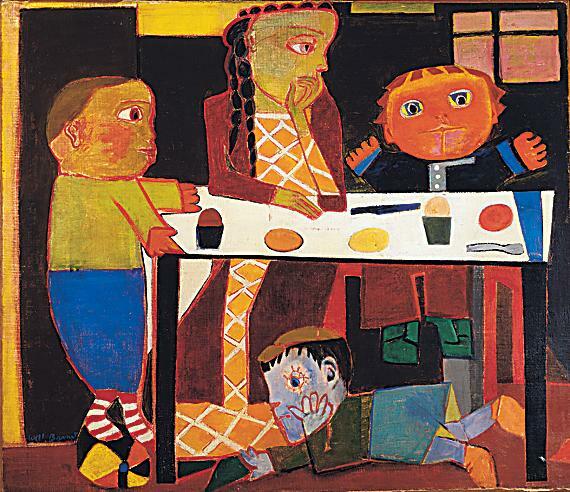 In the painting, Barnet’s wife and three children surround a kitchen table. In sharp contrast to Idle Hands, all of the flatly rendered elements in the painting are brought to the foreground without any hint of depth or pictorial illusion. Childen Drawing, also from 1946, exhibits similar characteristics. In 2003, Barnet returned to abstraction to explore form, space, and color anew. Strolling, from 2008, has a lighter palette and freer and more open sense of composition than many of his earlier abstract works.